of the vast space between the stars. of the dim grey light before the dawn. that has no need of words. uniting in an alchemical wedding. and all the world their court. The Lovers is such an exquisitely beautiful poem! I am in awe of the way the deep oneness between two people is described in the poem. This poem also has a strong mystical aura to it, consider "....these are no masks they wear but their true selves with all else burned away in the white fire of love's simple existence. For love has no need of masks and acceptance is all and everything." There is a hint of surrender to unconditional love, that is a love so pure it loves without expectation of anything. 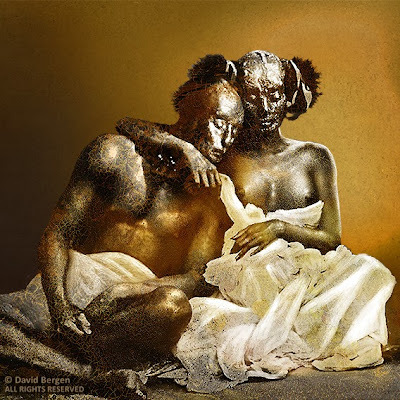 The image by David is very striking, exotic, and masterly. It seems to express both tenderness and friendship. Dear Joseph, yes, as you describe, what I wanted to express here is the love which goes beyond all borders. I believe that such love is the closest that there is (and that we can experience) to what we think of as divine love. So it follows that the closer we can approach this state, whether with a partner, or in our own relationship with our spiritual selves, the closer we draw to that experience of the divine. As I know you are aware, this is what the mystics describe, in deep contemplation or in meditation, pure love opens the door. Thank you also for your comment about David's painting, which so completely mirrors my words! for past selves left far behind:"
In all modesty, Marilyn, these are my favourite lines also and when I wrote them I hardly knew where they came from myself. But I do know that they seemed like a gift. Thank you so much, dear Destiny... how your words come dancing into my hemisphere... a dance that overpowers any language, dear sister!